Make protein the star of your dish with these recipes that meet your macros and calm your cravings. From burgers to curry, we've got your culinary cravings covered. I don't know about you, but I love Mexican food! These healthy enchiladas are filled with spiced ground beef, peppers, onion, and melty cheese. Yum! They're easy to make, low in fat, and gluten-free! I divided my enchiladas into airtight containers for a week's worth of meal prep. Convenient and delicious! Looking for a flavorful, easy meal-prep option? These healthy Greek burgers are delicious and can be made with either lean ground turkey or ground chicken. I just love how the flavors of mint, oregano, lemon, and feta come together in a symphony of deliciousness! If you're not a fan of mint (like my hubby), feel free to leave out that ingredient. I serve this with broiled asparagus, corn on the cob, and my homemade tzatziki sauce. Yummy! Whether you choose lean ground turkey or ground chicken, I don't recommend using anything leaner than 93 percent. Otherwise, your burgers will come out dry and dense. Also, when you combine the burger ingredients, don't over mix; combine only enough to evenly distribute the ingredients. You can also use seasoned bread crumbs in place of the rolled oats! Here's a meal prep idea for all you Thai fans! 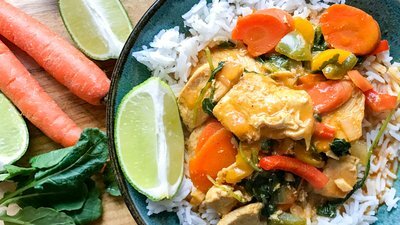 Thai cuisine happens to be one of my favorites, so I was quite happy with how authentic this simplified version of Thai chicken coconut curry came out. It's kind of a "cheater" recipe, in that I used Thai Kitchen red curry paste instead of dried chilies and all the individual curry spices. But hey, it tastes amazing and comes together easily, which is what I was after! I absolutely love this dish served over fragrant basmati rice. You could also use riced cauliflower for a low-carb version. Two ingredients that are a must when making curry are fresh ginger root and fresh garlic cloves. I would advise against substituting dried spices here, but if you must, use one-eighth of a teaspoon of dried ginger powder and one-quarter of a teaspoon of garlic powder. It won't taste nearly as fresh or flavorful, but it'll get the job done. This is my new winter favorite! I adapted the recipe from Food.com's Country Hamburger Lentil Soup, making it higher in protein and slightly lower in carbs. I also tweaked the seasonings a little to suit my taste. The result is hearty and savory—perfect for when you want to curl up on the couch with a warm bowl of something tasty.